Music party theme is a classic look of black and white musical note themes to create a swinging party for your guests. Musical party supplies and decorations can be used for many of the popular days of music as the twenties, fifties, sixties, seventies or eighties party themes. So, mix and match each era's theme decorations with our musical party supplies. The Musical Note Gleam 'N Spray Centerpiece features black musical notes with a black foil base and pink and blue metallic accents. Each Musical Note Gleam 'N Spray Centerpiece measures 18 inches high and is made of metallic foil and includes weighted base. The Musical Note Gleam 'N Spray Centerpiece is perfect for your 50's party or any party you are jamming to the music. The Black Music Note Confetti feature black metallic pieces of musical notes. Each package of Music Note Confetti includes 1 ounce of metallic confetti. Decorate your tables with our Black Music Note Confetti for a fun look. 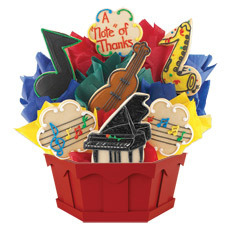 Send a note of thanks with this musical themed sugar cookie bouquet. This item is priced as a 7 cookie. this Musical Keyboard Arch features a piano keyboard half circle arch with a sheet music topper that allows you to personalize. Our 9 feet high x 10 feet 6 inch wide free-standing Piano Keyboard Arch is made of cardboard and printed on one side. Use this Musical Keyboard Arch as the main entrance, focal point or photo op for your music party. The Sax Balloon Arch features two cardboard saxophones accented with Mardi Gras masks, beads and Bourbon Street signs along with 6 dozen latex balloons in gold, green and purple. this saxophone balloon arch measures over 9 feet high x 8 feet wide and includes a jazz sax trio sound chip. Helium (not included) is required to inflate the balloons to create the arch. Jazz Sax Player Standee and Jazz Trumpet Player sold separately. Use this Customized Musical Notes Banner to announce your next band concert. Our Music Background is printed with elegant black and white piano keys and music notes. Each music note background is printed on one-side, and is made from sturdy cardboard. The Music Background is 4 feet 8 inches high x 28 feet 9 inches wide. Our Giant Treble Clef Music Standee is printed on sturdy cardboard and is free-standing. Each Giant Treble clef Music Standee is 7 feet 6 inches high and 3 feet 10 inches wide. Music Magic Standee features a piano keyboard with music notes in black and white. Each Music Note and Keyboard Standee measures 7 feet 6 inches high x 3 feet 10 inches wide. Our Black Music Note Standee Set makes a great addition to any music themed event. Each set of three black cardboard music note standees measure 3 feet 10 inches high x approximately 1 - 3 feet wide. this Sheet Music Standee features a couple sheets of antique looking sheet music. Each Antique Sheet Music Standee measures 8 feet high x 4 feet 8 inches wide and is free-standing. Giant Music Note Standee makes a great addition to any music themed party. Each black cardboard Music Note Standee measures 7 feet 6 inches high x 3 feet 10 inches wide and is free-standing. Our Music Guitar Standee is printed on sturdy cardboard and is one-sided. The Music Guitar Standee is 7 feet 6 inches high and 3 feet 10 inches wide. Our Neon Musical Note Whirls feature brightly neon colored musical notes hanging from metallic swirls. Each neon musical note swirl hangs 3 feet and comes in a package of 5. Hang these Neon Musical Note Whirls for lots of fun color.